Marcelina began her musical education as a cellist at the Karol Szymanowski School of Music in Wroclaw. She studied at the Karol Lipiński Academy of Music in Wroclaw in the class of her mother, Maria Czechowska-Królicka, and graduated from the Academy with distinction. In 2012‒2013, in frames of ERASMUS exchange programme she studied with Lilija Greidane at Jazeps Vitols Latvian Academy of Music in Riga. Since 2013, she is a doctoral student at the Academy of Music in Wroclaw. The singer has successfully participated in a number of competitions. 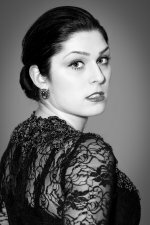 She was the winner of the prize for the Best Oratorio Performance in Musica Sacra International Vocal Competition in Rome (2012), a finalist of Andrzej Hiolski International Vocal Competition (2012), won the 2nd prize in the 6th Halina Halska-Fijałkowska International Vocal Competition in Wroclaw (2013), 1st prize in the Competition I love Mozart in Poznan (2013), was a laureate of the 50th Hertogenbosch International Vocal Competition in Netherlands (2014) and won the 3rd prize and three Special Prizes in Eva Marton Singing Competition in Hungary (2014). In 2013 Marcelina made her debut at the Gdańsk Opera Bałtycka in the role of Violetta in Verdi’s La Traviata conducted by Andriy Yurkevych. In 2014 she won the Jan Kiepura Award for the best debut of the year. Currently she is preparing the role of Mimi in Puccini’s La Bohème in the Krakow Opera House. She has participated in various festivals, has given recitals and collaborated with opera houses and philharmonic orchestras in Poland, Russia, Germany, Romania, Indonesia, Lithuania, Latvia, Netherlands, France, Italy and Hungary. She has recorded a DVD Musical Theatre of Poznan under the conductor J. M. Florencio.